Recently the City of Houston and the Harris County Flood Control District added new flood mapping tools to their websites. The City’s tool estimates the difference between the ground elevation and the 500-year flood plain. The map is color coded for incremental differences up to five feet. The minimum elevation for any structure in a 500-year flood would be the difference shown on the map plus two feet. So, for example, in the areas in purple (>5), any structure would have to be, at least, seven feet off the ground. Click [here] to see map. The Flood Control District’s tool estimates the areas that were inundated during Harvey and the Tax Day flood in 2016. Click [here]. Note that you must click the “Inundation Map” box and then drop down to the “Historical” tab and enter the dates you want to view. I do not have any way to gauge the accuracy of these maps. There are extensive disclaimers on each. But if they are anywhere near correct, the impact of the City’s new 500-year flood plain plus two feet (“500+2”) ordinance is going to be severe and, in many cases, unnecessary. Even more troubling is that the new requirement disproportionately affects historically disadvantaged neighborhoods. There are large areas in neighborhoods like Kashmere Gardens, Sunnyside and Shady Acres, to mention a few, where it will be difficult, if not impossible to build economically. Property values in these areas will almost certainly suffer, many of the properties never flooded. [i] In addition to homes in these areas, there are also hundreds of businesses, schools, churches, senior care facilities, libraries, clinics, etc. that will be affected. The area around Sims Bayou is one of the more dramatic examples. Below are screenshots from an area along Sims Bayou from these new mapping tools. What they show is an area where the new 500+2 ordinance will require buildings to be raised 2-8 feet but did not flood in Harvey. Nor was there any flooding in this area during the Tax Day or Memorial Day floods. In fact, the HCFCD flood gauge system shows that the last time there was any consequential flooding in this area was in 1994. 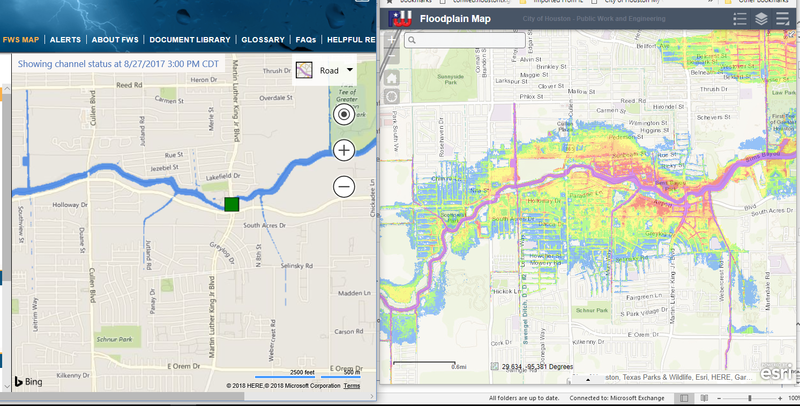 So why is there such discrepancy between the 500-year flood plain map and actual flooding over the last 34 years along Sims Bayou? The answer appears to be that there has been extensive flood control work done on Sims that has significantly improved the conveyance of flood waters in that area. But here is the catch: those improvements have not been reflected in the FEMA flood maps. So, the area is going to be subject to this onerous ordinance for absolutely no reason. I also toured some of the communities hardest hit by Harvey’s flooding recently to see how the City’s new 500+2 ordinance compared to the flooding in Harvey. What I found was that in many areas there is very little correlation between the new rule and what actually happened on the ground. In Kashmere Gardens, for example, there are about 30 blocks in which the new ordinance will require the structures to be six feet or more above the ground. But residents in the area told me that none of the houses had more than about 3-4 feet of water during Harvey. In some areas where structures must be raised over six feet, there was less than a foot of flood water. There are dozens of blocks where structures will have to be raised 2-4 feet, but suffered no flooding in Harvey. Every flooding event is unique. And just because an area did not flood in Harvey does not mean that it will not in the future, and vice versa. But these new mapping tools and my tour suggest that the flood plain maps (and especially the 500-year map) are, at best, rough approximations of where future flooding will occur. Some of the problem arises from the fact that the flood plain maps are seriously out of date in many areas, like Sims Bayou. Changes to the watershed which both reduce flooding and make it worse have been not yet been incorporated into the maps. New maps are due out in the next year or so, but the truth is that they will be out of date by time that are issued. We will never keep up with multiple, highly dynamic watersheds which sometimes interact with each other. And it is impossible to predict every exogeneous event that can occur during a storm – like the Corps deciding to open reservoir floodgates. The goal is one day to have a real-time flood map system to which we could load every change to the watersheds as they take place. But it appears to me we are light years away from that now. While I agree with the general proposition that we need to be building new construction at higher elevations, City Council’s knee-jerk adoption of the 500+2 ordinance was ill-considered and intellectually lazy. The resort to a one-size-its-all rule is going to further devastate neighborhoods that are already suffering. Much of the potential benefit from the ordinance could have been accomplished with a more modest increase in the elevation requirement that would not have carried the extraordinary financial and bureaucratic burden that will now fall on property owners. Many think the ordinance will mainly affect developers and builders, who, in some cases, have developed irresponsibly. But in reality, it will have little effect on them. They are simply going to move outside the City, further accelerating the growth gap between the City and its suburbs. Several builders have already announced they will not build in any of the areas covered by the ordinance, nearly a third of the City. The ordinance will also likely cause greater gentrification of historic minority communities. For many of the affected residents, their property is their single largest investment. This ordinance will be a financial disaster on top of the natural disaster many have also suffered. It will also affect the ability to build schools, churches and retail in the affected areas. And can you imagine trying to get building permits under the new ordinance? That process is already a nightmare and this ordinance is only going to make matters worse. You can also expect the City to spend millions in legal fees attempting to defend the new rule. Whenever you hear someone say, “we have to do something,” it is almost always followed by some bad public policy. After years of half-hearted flood regulation and squandering the drainage fees, the City felt it needed to appear to be doing “something.” Unfortunately, the “something” they decided to do will have questionable benefits and will create both a bureaucratic nightmare and severe financial hardships for many of our fellow citizens. [i] Obviously “never” is a long time, but in many areas there is no record on the HCFCD of any flood and residents I interviewed confirmed that recollection.